So I just celebrated another birthday this past week. If it's one thing I look forward to, it's all the free stuff you can get for your birthday. Here's a list of my favorites. I don't get to take advantage of all of them but make sure I redeem some of them. The expiration dates vary from one week, two weeks to even a month so don't feel like you have to do everything all at once! 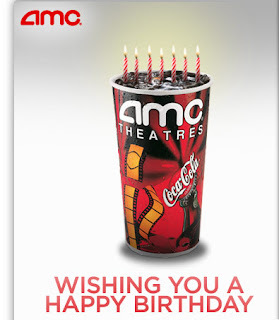 AMCEntertainment.com - Since I am a MovieWatcher member, I received a coupon via email for a free large soft drink. This is valid for one month. Aveda - Join the Aveda Birthday Club and receive a free Personal BlendsTM Pure-Fume SpiritTM or body care product (worth up to $25) custom-blended with the aroma of your choice. Valid for over 2 months. Baskin-Robbins - As a Baskin Robbins Birthday Club member, you receive a coupon via email for a free 2.5 oz scoop of ice cream. Valid for about 10 days. Bonefish Grill - instead of a free dessert this year, I received a gift card for complimentary bang bang shrimp. The gift card is mailed, but needs to be activated online. This is valid for a little over 2 weeks. DSW - As a DSW Rewards Member, you receive a $5 certificate during the month of your birthday. 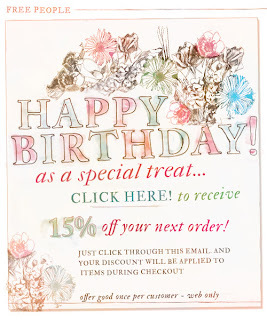 Freepeople.com - I received an email for 15% off my next order (online only). 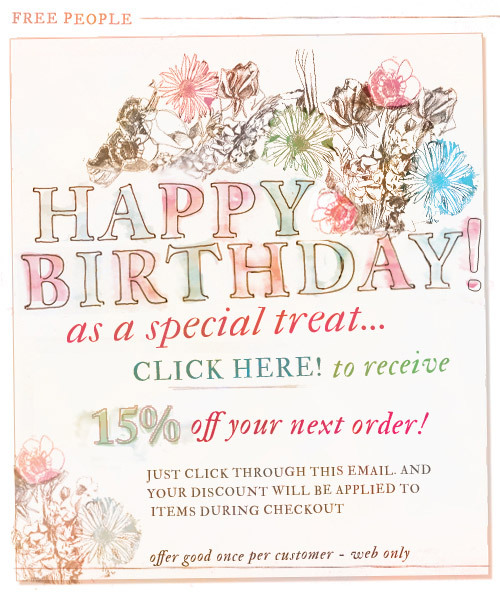 Loehmann's - If you like shopping, sign up for the Insider Club Card and receive 15% off your purchase during any one day of your birthday month. Longhorn Steakhouse - I think I'm a Longhorn Steakhouse Western Hospitality Club Member, which is why I received an email to print out for a free dessert. Valid for 2 weeks. Macy's - I received a $10 off certificate for the month of my birthday with my next Macy's card purchase of $30 or more (in-store only). 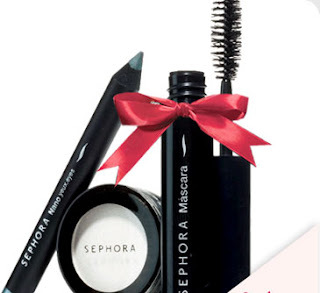 Sephora - When you sign up to be Sephora Beauty Insider, they will email you a voucher to redeem your free birthday gift. For my birthday this time around, they offer the 'Beautiful Eyes Kit' including lash plumper mascara, eyeliner and eyeshadow. Last year I got a 3-piece mini lip gloss set and the year before I got the vanilla cupcake shower gel. Redeemable 2 weeks before or after your birthday. Starbucks - When you join My Starbucks Rewards, they will mail you a postcard for a free drink. The postcard is valid for over a month.